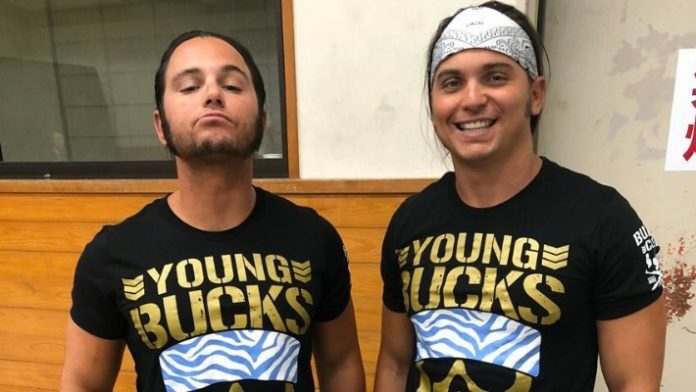 The Young Bucks say recent trademark filings related to All Elite Wrestling were done in effort to keep the group’s options open next year and protect themselves at the same time. Nick and Matt Jackson are guests on the upcoming episode of Petey’s Wrestling Perspective Podcast with co-host Dennis Farrell and the two brothers didn’t shy away from talking about the filings in an exclusive clip given to Pro Wrestling Sheet. Matt says the group all discussed the possibility of doing a follow-up to All In immediately after the successful event in Chicago. Everyone involved agreed that they’d have to do another at some point. “We’re in a situation now where we don’t exactly know what we’re going to do,” Matt explained. “But we do want to protect ourselves in case we decide to do something. In case you missed it, multiple trademarks were filed this month which seem to indicate future plans for events called Double or Nothing and All Out. The address listed on the docs indicates the group is working with the billionaire Khan family, who own the Jacksonville Jaguars. According to sources, Cody and the Bucks are leading the charge behind the scenes on this possible new venture for once their ROH deals expire. As we previously reported, we’ve been told Jim Ross and Chris Jericho would only be involved on a talent level should any promotion get off the ground. Jim Ross talked about this in a roundabout way on his latest podcast. “I’ve been rumored to be in every role in this company and what you find out is eye-rolling,” Ross said unhappily. The legendary announcer then discussed with guest Dave Meltzer how a promotion like All Elite Wrestling would need a TV deal with a major cable or broadcast network to be successful. Nick Jackson talked further about the future of The Elite during the interview with Petey Williams and said, “We have offers on the table from every major company in the world.” Matt additionally noted that they also have investors who want to work with the group. The full interview goes live this evening and covers the Bucks’ exit from Impact Wrestling, how it’s been working for Ring of Honor, getting talent over on Being the Elite and more. Subscribe to Petey’s Wrestling Perspective Podcast by CLICKING HERE. For now, listen to the exclusive preview below.